Two things have happened recently which resulted in my ever tolerant husband going along with my crazy, acting as though I’m completely rational, when we all know that my drummer takes some liberties with its marching beat. First, we saw a preview for Once More: The Story of VIN 903847 and I got wildly excited. If I was accustomed to squeeing and flailing fan-girl style, I totally would have done it. Over a VW Beetle. From 1955. Next, I found that the last VW busses had been rolled of the line in Brazil and my stomach went to my toes. Partly because I was ashamed that I didn’t even know that they were still being produced – I thought the Mexican end to production in 1995 had been it – but also because I felt loss. Huge loss. It was a reminder of what I once had, and what I’ll never have again. Tripper. 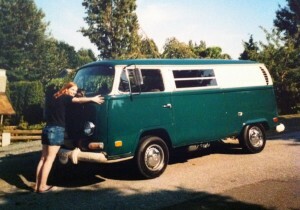 My 1971 VW Bus. My first car, the vehicle I bought when I was sixteen. The combination of mechanics, metal, and rust that was – is – so much more to me than just a car. She was twenty-nine years old when I bought her. I’m sure some folks wouldn’t even identify her as a vehicle by that point, considering what standard features we take as givens these days. Tripper didn’t have automatic windows (in fact, only one of them even opened). She didn’t have AC (or heat, for that matter). She didn’t have a rear defogger (or a front one either). Tripper didn’t have airbags (and I once screwed my non-adjustable seatbelt back into the wall by hand). But she had something that none of my vehicles since can even attempt to claim. She had spirit. She had personality. She had things to teach. 1. Work for what you want, even when you’re told that it’s pointless. And I don’t mean go out and make the money to buy things, either. I did that too, buying, insuring, and repairing Tripper with my pay from working at Mickey D’s, but I mean mentally working. Finding a way to get what you want, despite what others – or your own fear – might be telling you. When I was searching for a VW to buy, I had a middle-aged man tell me flat out that I shouldn’t buy one because they didn’t have power steering and a sixteen year-old girl wouldn’t have the strength to drive it. I had another tell me that unless I had my own toolkit and knew how to do daily repairs, a bus wasn’t for me. Their vans clearly weren’t right for me, since they wouldn’t even set up a time for me to go look at them. But if I had let them sway my thoughts, let men who had never met me, who knew nothing of my driving skills or ability to learn, tear me from my goal, the rest of this post wouldn’t exist. Tripper wouldn’t have had the chance to teach me. You never know the impact that one abandoned dream will have. 2. Believe in your adaptability. When I started my search for a VW bus, I only knew how to drive automatic. I was focusing my search on auto transmissions, which had a swanky name that escapes me now, but were only available toward the end of the bus’ North American market sales, and were rare at that. I couldn’t find a single auto for sale. If I wanted a VW bus – and I did – I was going to have to adapt. I was going to have to learn how to drive a manual. The only issue was that nobody I knew drove a manual vehicle. I was going to have to buy a standard van without having any idea how to drive it, and learn later. So I did. And I’ve been driving stick since. Had I kept my narrow focus of what requirements I needed for my car, not only would I not have bought a bus, but I wouldn’t have had a reason to learn how to drive a manual transmission – which is something that I truly love. With Tripper, I learned that I love driving standard, something that was wholly unfamiliar before I jumped into it. Who knows what it will be next? Having a car that was nearly twice my age came with some challenges – largely of the mechanical variety. Tripper once took to shifting into reverse instead of second. The throttle stuck while I was on the highway. Her sliding door fell off. The starter seized multiple times. I could go on. Can’t shift into second? That’s an impromptu lesson on how to skip shift. Can’t stop accelerating? It’s a lesson in problem solving (use the clutch to control speed, then find WD-40). Car is missing an appendage? First, panic. Then figure out where it came off, and put it back on. It’s deductive reasoning. Starter won’t turn over? Use what you have around you – in my case, a double-sided ax was just the right length to smack the stubborn starter. That doesn’t work? Find a Plan-P – for pop-start. I couldn’t control Tripper’s personality quirks, but I can’t control most things in life. She taught me that sometimes, you just have to go with it, finding a way to make it work, and reminding yourself that it’ll make a good story – one day. 4. When driving, your priority is, well, driving. Tripper came into my life in 2000, which is about when my first cell phone appeared. It was the era of phone calls reminding me to drive carefully – while I was driving. I had no desire to talk on the phone though. If I talked on the phone, I literally couldn’t drive. Especially when it was raining. Remember, Tripper was a 1971 model. She came from the era of two windshield wiper speeds – fast and faster. If I wanted intermittent wipers, I needed to control them myself, turning dashboard knob on and off by hand. While steering a vehicle whose wheel was the size of an actual bus, without any power steering. Oh, and I had to hold the shifter in fourth gear or else it would pop into neutral. Not to mention that I was carrying a partially full propane tank, and would have had two broken legs and a possible impalement (from the steering column) if I hit anything head on. I had no desire to concentrate on anything other than my driving. I still don’t. 5. Sometimes, people just don’t get you. And that’s okay. She was still confused when we finished; she knew what I was driving, but just didn’t get why I’d want this vehicle. I had acquaintances cover Tripper in saran wrap on a hot day, not caring what it might do to her paint. She got egged. I had an air-care worker tell me that I was driving the wrong kind of car for a girl like me. Even now, when I tell my students that I used to have the same vehicle that’s on the cover of their textbook I’m met with only one question: why? But the random strangers that I ran into as gas stations got it. I had people stop me to tell stories of trips they had taken in their youth, or of friends who had once owned a bus, or to ask if I would consider selling. The friends who hung-out in Tripper during high-school lunches, slept in her while camping, or pushed her when she broke down, they got it. They would later tell me that riding in the front seat terrified them, but they still got in, because they got me. Some people thought – and think – that I was completely insane for having a 1971 VW van, but that doesn’t matter. Their opinions, frankly, don’t count. They don’t know me. They didn’t see how I was when I was with Tripper. They can’t understand the impact that she had on me. They’ll never understand my affinity for a drafty, temperamental piece of machinery, just as many will never get my willingness to spend my days with moody teenagers, and that’s okay. There will always be people who I know, and who I have yet to meet, who get me. And that’s what matters. 6. Even when it’s painful, even when you don’t want it to, the end will come. Let it. By 2004, Tripper was thirty-three years old. She was starting intermittently, often needing a jump to get going. Her headlights stopped working. The rust spots were becoming rust holes. And I was about to graduate university, ready to enter the working world, but unprepared for commuting. After all of our adventures together, this was one that Tripper couldn’t join me on. My lifestyle was changing, and she no longer fit. I wanted to keep her. I even had a false start at selling her, taking down all of my ads after the first punch in the gut inquiry call. But as much as I wanted to, I couldn’t go back to our carefree student days, where it didn’t matter if my plans were pushed back by an hour if I needed to find a jump start, or my nights ended with BCAA’s arrival. I had to move on, become a working adult, and that meant that I had to move on from Tripper. So, I sold her. And I was heart-broken. I cried. I moped. I kept mementos. But I didn’t regret it. I still don’t. I knew that it needed to be done, because people change. Situations change. We can’t pause time, or even keep just the really good parts forever. Often in life, moving forward means moving on. And it works out. I can still recognize the sound of a VW engine on the road, although the distinctive rattle is becoming less and less frequent. But I’ll keep turning my radio down whenever I think I hear the rumbling of an air-cooled VW until there are no more to hear. I’ll listen to the engine noise as the driver pushes it through its gears, and I’ll smile, happy that Tripper’s cousins are still out there, teaching somebody whatever they need to learn. ← Ask me about 2013 in five, maybe ten, years.